We’d also like to know your opinions about our picks and/or your picks this week. Please leave a comment below to chime in. Buffer has long been one of my essential business tools; I use it every day. Which is why it’s so surprising that it took me this long to select it as a weekly pick! Partly this has been that until very recently, Buffer’s iOS app was suboptimal to say the least. The service itself, and their website for that matter, are super stable and haven’t been down once since I started using it over a year ago. If you’ve ever seen ANY of my posts on either Facebook or Twitter, it’s pretty safe to assume that it was published using Buffer. The service connects to several social networks (Twitter, App.net, Facebook, LinkedIn and even Google+ Pages) and allows you to not only publish messages to several accounts at once, it also allows you to schedule them in advance and provides analytics for every single post. 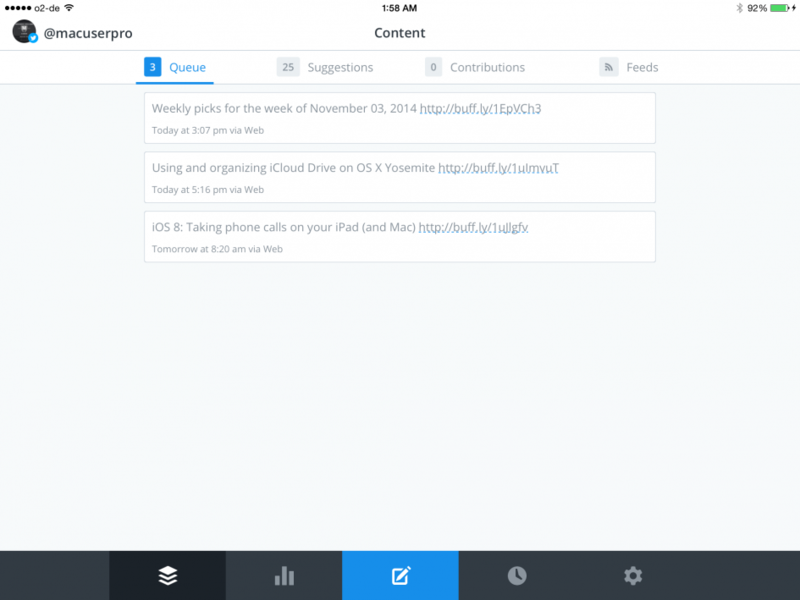 The iOS app works on your iPhone, iPad, and iPod touch and also comes with a convenient share extension that allows you to add posts to your buffer queue from virtually any app. Buffer’s interface is simple (one might even call it minimalistic) but very clear. It also allows you to see your analytics, reorder posts, and refine your schedule, which comes in handy when you need to quickly change something on the go. Stay tuned for a more in-depth article about how you can use Buffer for your business purposes! With the increased desirability of iOS devices and the private information stored on them, it has become vital to protect not only your iOS device but the data that is stored on it. As someone doing serious work with their iOS device I have one recommendation for you: When iOS requests enabling Find my iPhone, enable it. Why it is so vital to enable this feature? I am glad you asked! To start with, enabling Find My iPhone allows you track your phone using the Find My iPhone iOS app and via iCloud. Additionally, Find My iPhone also allows you to have the phone generate an audible chime to assist with locating it, set a password remotely, display a message on the screen, and in the worst-case scenario, wipe and brick the phone. I have utilized the chime (more than once) when I misplaced my phone at home, which has always helped me find it. On a sadder note, I have had to utilize the remote feature once (so far) when my iPad was stolen. Even worse, this was before wiping the iPad would brick it so the thief had a shiny new iPad. Most important at the time, the wipe made sure the thief would not have access to the data contained within the iPad. *Disclaimer: Do not retrieve your phone from a thief without getting the local authorities involved. It is much safer to have professionals retrieve the device so you don’t get hurt. It seems that if you are an Apple user, you know other Apple users. And since it gets easier all the time to just pick up “official” accessories, it seems that any time a few iPhone or Mac users congregate, there ends up being an inevitable Dance Of Cables. They’re all the same so it’s hard to tell which one is yours. (Unless you’re Kelly, then you put Hello Kitty stickers on everything. And refer to yourself in the third person occasionally.) A simpler answer than a sticker is Buoy Tags. They are custom-made plastic pieces that snap together around your headphone, laptop, or 30 pin/Lightning cable. You can just use the little red marker as the designator, or you can customize it with your initials, other colors, or even download a template and put a company logo or whatever you like behind the clear plastic on the non-red side. I put mine right up against the cord on my MacBook Pro adapter, and not only can I tell at a glance which one is mine, but it also keeps me from bending (and eventually fraying) my power adapter cable. I have them on everything and unlike other Apple accessories, they’re super budget friendly. You get a set of three Buoy Tags (power, headphones, iPhone cable) with an assortment of letters and colors for $12. I’ve had mine for over a year and so far they’ve stayed attached to everything, and a couple of times when I had to remove one it did come off, but it took some doing. Given how many people have the same cables now, it only makes sense to help yours stand out.